The DS-Z5 is an easy to use, computer based digital signage machine with support for up to 5 content displays. This simple, yet powerful system allows you to push information out to a monitors or large screen TVs. One monitor is used as the ‘control monitor’ to manage everything, and the other video port is used to display your content. If your content display (TV or monitor) is beyond 10 ft away, we have optional Video Extension Modules. Extend audio and video at distances up to 300′ over standard CAT6 network cabling. Add this option during checkout. 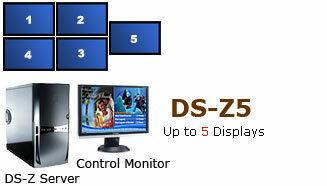 Set up your DS-Z5 Digital Signage System. Connect your TVs or monitors (content displays) that will show your information. If you are extending video, run a CAT6 cable out to your content display and connect the video extenders. Create your digital signage ‘content’ (software included). Click to ‘send’ your content out to the display, that’s it! FREE Login Tech Support Service (worldwide). There are two options to connect to this system based on how far away your content display will be from the system. Option 1: If LESS than 10ft away, you do not need to use the video extension option. You will connect the video cable directly from the video card ports (DisplayPort, HDMI, DVI or VGA), straight to the port on your content display. In this case, we will provide the appropriate 10ft video cables (DisplayPort, DVI or VGA) and adapters with the system based on your selection at checkout. We do not sell HDMI cables but you can pick those up at any Best Buy or office store. If you do NOT require video extension modules and you are connecting less than 10 ft, you will obtain the full resolution of the video card used in the system. Your choice of 10 ft DisplayPort, DVI or VGA video cable is included with the system if you are NOT extending. Just let us know which you prefer in the comments box during checkout. Video Extension Modules (VEM’s): Extend video at a distance of up to 300′ using our optional video extension modules (VGA, DVI or HDMI). DisplayPort cannot be extended. This is an example of our HDMI Video Extension Modules which can be used to transmit video as well as audio up to 300‘ over CAT 6 network cabling. (Note 1 or 2 CAT 6 lines may be required depending on your objective). A small VEM Transmitter module connects to the video source of the DS system on one side of the module, and on the other side outputs to CAT 6. 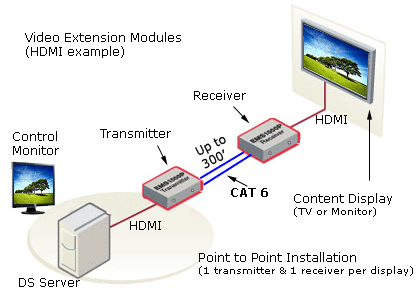 The matching VEM Receiver module located at the content display on the other end receives the CAT6 input, then outputs to the video source on the content display, in this case HDMI. Audio may also be transmitted along with video when using HDMI extenders. DisplayPort if less than 10ft away, will also carry audio and video, but DP cannot be extended. If you do not require audio, you may also extend over VGA or DVI to extend video only. VEM’s are connected over 1 or 2 x CAT6 network cables for each VEM depending on the type of connection used. Customer must provide and run CAT6 cables to each VEM. VGA: 1920 x 1200 up to 300 ft / 1 x CAT6 line needed per VEM. DVI: 1600 x 1200 up to 160 ft/ 2 x CAT6 Lines needed per VEM. HDMI 130 ft: 1080p up to 130 ft. / 2 x CAT6 Lines needed per VEM. HDMI 300 ft: 1080p up to 300 ft / 1 x CAT6 line needed per VEM. Up to 5 x TVs or monitors to display your content (PowerPoint, schedules, menu boards etc). Short video cables to connect from the Video Extension receiver module (if used) to your TV or monitor. These short cables are normally provided with your monitors or TV’s. If you need to extend video farther than 10′ away, choose a Video Extension option during checkout.